Kale has been a trendy vegetable for the past couple of years, but many people wonder what you can really cook with it, besides using it to spruce up a salad. Kale is a member of the cabbage family, and while other types of cabbage are good for us because they contain a lot of vitamin B2, kale provides us with lots of beta-carotene (necessary for vitamin A production and great for our vision), vitamin K (good for our blood), vitamin C (good for our immune system) and lutein (also great for vision!). Kale also provides calcium, an important nutrient for growing and maintaining healthy bones! 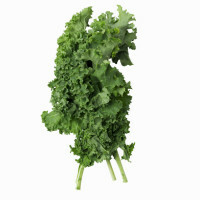 For those who can’t tolerate dairy, kale is a great source of calcium! Getting your kids to eat enough greens can be challenging so here are some ideas your kids and family will like with kale! Cool for several minutes and enjoy these healthy, baked snacks! Heat the olive oil in a large stockpot. Add the onion and sauté the onion until translucent, about 10 minutes. Add the garlic and sauté for 2 more minutes. Add beans, carrots, potatoes, tomatoes, celery to the mixture and sauté 1 minute. Add the vegetable stock and salt. Bring to a boil. Immediately lower to a simmer and cover the pot for 1 hour. Season to taste with salt and pepper or other seasonings such as paprika, fresh herbs or Italian seasoning. Serve in bowls and stay warm during the next snowstorm or enjoy on a cool day! Some other ideas for kale include using it for a boost of calcium in quinoa salads or rice. You can even use it in smoothies without changing the taste! Choose kale over iceberg or romaine lettuces for an extra kick of nutrients in your salads! Learn more about the super food kale!